This book is back in of stock. THIS IS NOT A MEDICAL BOOK TO BE USED TO TREAT ILLNESSES. IT IS A HISTORIC REPRODUCTION TO PROVIDE A HISTORIC CONTEXT FOR NINETEENTH CENTURY MEDICINE. Originally published in 1837. Despite the warning above, the book does begin by stating that medicine should only be given if necessary and provides considerable advice, drawing upon knowledge of the body at the time, for healthful living. However, recognizing sickness will occur, it contains instructions for making foods for the sick and discussions of diseases of children (some diseases like whooping cough are relatively unknown today due to vacination). There is also discussion of common medicines as well as herb and roots used in treating illness. This latter section demonstrates that, just because something is herbal doesn't necessarily mean it is innocuous. There is one herb that is described, "the oil is so powerful that a few drops destroy life immediately; ..." You can see why we start the discussion of this book with a warning! 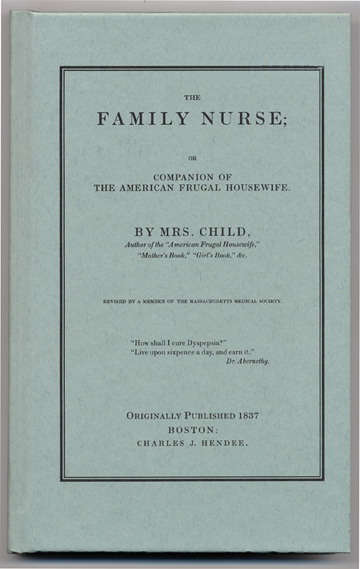 The book concludes with a collection of treatments and simple medicines. Many of the treatments are no longer practiced, such as blistering and leeches, but some are still part of medical practice, although often the specific materials used may have changed. AS MENTIONED EARLIER, THE TREATMENTS IN THIS BOOK ARE FOR HISTORIC CONTEXT ONLY AND MUST NOT BE USED FOR ACTUAL TREATMENT OF AILMENTS.